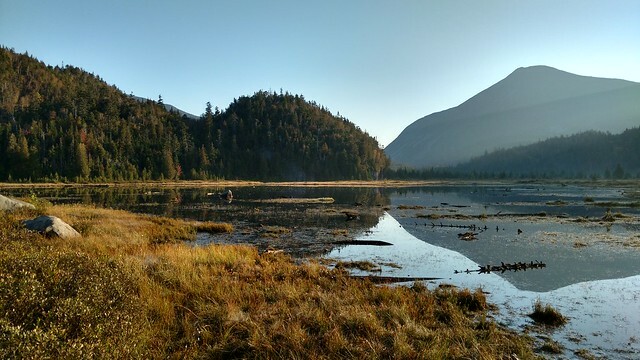 I'm currently 14 peaks shy of completing my tenth round of the ADK 46. However, I've left the completion of my ninth round dangling for months. Why? Because my eye is on the ADK Grid (552 peaks) and 46er "rounds" don't really figure into that calculation. However, they do serve as happy little milestones on the long road to 552 peaks. This month, a hike to Cliff and Redfield would be a twofer. The peaks filled September's Grid and tied the bow on my ninth 46er round. However, I had concerns my right knee would force me to sit out the rest of September. On September 2nd, I hiked Seymour, Seward, Donaldson, and Emmons (SSDE) in a respectable 11 hours. Although it was my fourth SSDE, it was my most challenging hike this year and I felt I handled it in good style. 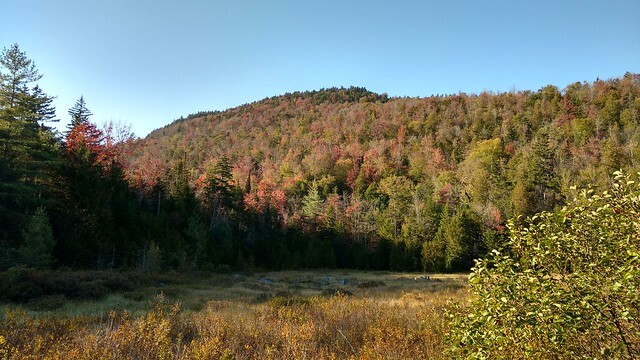 My next hike was the Lower Great Range on September 13th with Bib. Everything north of Gothics was with knee pain the likes of which I've never experienced before. Descending was miserable and ibuprofen did nothing to take off the edge. The next day I could barely get down a flight of stairs. Neil theorized Iliotibial Band Syndrome and it definitely shared some of the earmarks. I employed RICE and four days later on the 17th, with some trepidation, hiked Cascade and Porter. Everything went well until the descent when the pain returned but, thankfully, not nearly as severe. I rested it for an entire week and it was noticeably better but far from healed. A hike to Cliff and Redfield from Upper Works involves more distance and ascent than Allen; it wouldn't be a milquetoast test of the knee's recovery. I arrived at Upper Works shortly before 10:00 PM on Friday. A Barred Owl's delightful "Who, who, who cooks for you?" called out from the woods. I parked in an empty slot on the western side, stepped out into the darkness, under a gorgeous starry sky, and heard the sounds of murmuring nearby. At first I thought the voices were coming from the woods but I quickly realized they came from the car next to me. Nuts! I could imagine its occupants thinking "Really? What rotten luck! Out of the entire parking lot, he parks next to us!" I got back in my car and found another nearby spot. More privacy for both of us. Fifteen minutes later I was comfortably sprawled in my car, marveling how warm it was, listening to the Hudson's white noise through the open windows (covered by netting held by magnets) and patiently waiting for the sandman to arrive. I awakened a few ticks before the 5:30 AM alarm sounded. My nearby neighbors were up as well; their car's interior glowed with soft light. I dressed, crawled into the front seat, laid out a few "don't forget" items on the dashboard, and reached into the cooler for my cold breakfast. Sitting alone in the passenger seat and munching granola thoughtfully by headlamp in the predawn, is either profoundly zen or desperately lonely. Probably a l’il bit o’ both. I fired up my electrical gadgetry, did a quick gear check, locked the car (without the honk, thank you very much) and turned to discover at least three other vehicles alive with the sights and sounds of predawn hikers. I took my place behind a hiker signing in at the trail-register. Good morning, small-talk, small-talk. We were both heading to Cliff and Redfield and I said we would probably leap-frog one another all day. I was asked if I'd like to join forces but I politely declined. Before long, I caught up to the hiker and, being gregarious when the mood seizes me, proceeded to talk about hiking for the next 2.5 miles. I learned the hiker is an aspiring 46er, often hikes alone because of limited hiking companions, her husband is uncomfortable with lengthy hikes, etc. However, I fear I may have monopolized the conversation because somewhere beyond 2.5 miles I looked back in mid-sentence and discovered I was alone. Oopsie! I heard rustling in the distance and assumed she either headed off for a bio-break or slowed to escape my monologue. Either way, it seemed creepy to wait, so I continued alone as per my original plan. We never crossed paths again. Early morning at Flowed Lands. One hour and forty-five minutes after departure, I arrived at Flowed Lands and spoke to a young man who shared one of the best 'hard-luck' stories I've heard. Out of a group headed to Allen in winter, only he and another made it to the summit in miserable conditions of rain and wet snow. They exited late at night and, during the drive along Upper Works Road, he drove into a fallen tree hidden beneath the freshly fallen snow. The repairs would cost him $1500. The trying day wasn't over yet. Along Blue Ridge Road, he and others were blocked by more fallen trees. Fortunately, a snowplow arrived and pushed the obstacles off the road. No pain was spared for this jaunt to Allen! At the cairn for Marshall we parted company and I wished him luck. A few steps later I turned east, passed the Herbert Brook Lean-to and headed to the Opalescent River. The river's rocky beach offers a magnificent view of the MacIntyre Range and Colden. MacIntyre Range from the Opalescent River. The water level was low and I was able to easily rock-hop across to the east side and thereby avoid the PUDs (pointless ups and downs) near Colden Dam. It also allowed me to reconnoiter the nearby designated campsites and determine if anything had changed (same as it ever was). 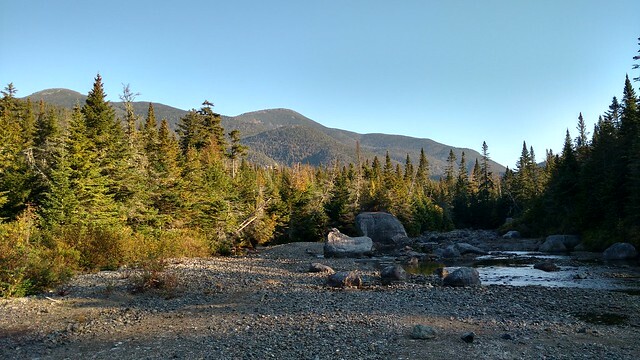 I passed several occupied sites then turned up the Mount Marcy Trail towards Uphill Brook Lean-to. The trail's ladder-ish staircase has been repaired (top 2-3 steps had fallen off). Naturally, I paused briefly to admire several of the waterfalls and cascades along the river, including peering over the precipice, into the gorge, and wondering when would the trail collapse into it (not today I hope). Cascades along the Opalescent River. Up until now I had been pausing occasionally to massage the outside of my right knee. However, on two occasions it stung so badly I couldn't put my full weight on it without causing even more pain. Another session of deep massaging numbed it. However, it did cross my mind that, if this persisted, I may have to abort the trip and hobble back to Upper Works. Before long I reached the point where the trail descends and signals the proximity of the junction for Cliff and Redfield. It had taken me three hours to cover 7.2 miles so, despite an unhappy knee, I was doing OK. I turned south along the unmarked trail to the cairn and then west to Cliff. The path is now terribly braided as a consequence of hikers seeking to avoid the wettest and muddiest parts. From past experience, I went directly into the standing water and "log-rolled" across the many trees, rocks, branches, and ancient bits of corduroy within it. I traversed it with nothing more than muddy shoes and I consider that a win. It's faster, and less destructive, than threading through the rapidly eroding bypasses. On the return leg, a small miscalculation netted me a cold rush of water into my trail-shoe. I smiled and conceded "Well you got me! Now we're tied one-one!" The balance of the ascent was desert-dry. For amusement, I recorded the location of two ramps, two ledges, and one slab. In other words, there are at least five notable "vertical scrambles" and all continue to expand in width as hikers seek easier ways around them. The one improvement, if you can call it that, is one muddy slope has lost so much organic matter that the remaining bed of small stones makes for better footing. The mud atop Cliff's eastern summit ("false summit") wasn't quite the consistency of fudge so I used the long-fallen log as a catwalk. Not much else stood in my way and I reached Cliff's summit 3h 50m into my hike. I met no one during the ascent and had the summit to myself. I doubt Cliff will ever make the "Overcrowded Peaks" list. I celebrated with a salted caramel, my first snack of the day. Game-face was back on for the descent. Five, four, three, two, one and then zero vertical hurdles in my way. My foot paid some "water tax" while re-crossing the wet section and then Cliff was done. Onward to Redfield for its superior views. I paused at Uphill Brook Falls to take in the view that had captivated me seven years earlier during the completion of my first round. I snapped a few pictures of the distant MacIntyre Range framed by forest and water. I vowed to spend a bit more time on the return leg. Algonquin from the top of Uphill Brook Falls. I wove in and out of the brook and trail and then turned away from Uphill Brook to follow the path to Redfield's summit. I passed a couple from Quebec and plodded upward in the increasing heat. A powerful thirst had me pause to drink from the second liter of water I had brought. That perked me up and made the remaining vertical feet feel less onerous. At 5h 40m into my trip I stood atop deserted Redfield. It was just short of noon so I moved to Redfield's southern lookout to down a PB&J, and another salted caramel, in quiet celebration of nine rounds. The sun was beating down and everything south of Redfield was blanketed in haze. Allen, Cheney Cobble, and the North River range were easily discernible but everything farther afield was in soft focus. Before long, I overheard the couple's arrival, punctuated by a French-Canadian cuss word ("Ciboire!"). I laughed in response and raised my arm to signal my location. I invited them to join me at the lookout for its unobstructed views. My objective to climb both peaks before the noonday heat was done and I was in no hurry to leave the summit. Had no one arrived, I might have spent my usual 5-10 minutes on the summit and returned to Upper Works by 4:00 PM but, what's the hurry? We introduced ourselves, spoke at length about hiking, talked about the amazing exploits of native son "Pinpin", and eventually we were taking selfies together. I mentioned I slept at Upper Works the previous night and they said they had done so as well. Then we had a good laugh because they were the "murmurers" in the car that I had parked next to initially. Forty minutes later we said our goodbyes and I turned north to begin the 8.5 mile walk back to Upper Works. Before leaving I paused for a few more photos of Marcy and lucked out when another couple came into view. They provided a sense of scale to the photos. They were young and dressed for the beach (or gym) which was entirely appropriate for this hot day. I think I met more shirtless, or sports-bra clad, hikers than in July. Upon reaching Uphill Brook I eagerly stepped off the rough trail in favor of the brook's smooth slabs. While studying how to get around a broad pool, I was startled by the presence of a hiker, and leashed dog, standing above me on the trail. He asked if it was possible to follow the brook instead of the trail. I confirmed but cautioned him the trail follows Uphill Brook only for a short distance before veering away. He also asked if it was possible to bushwhack to Skylight. I did my best to dispel his notions that it was "flat", "easy", and "short". I said his dog would hate him for it. He joked "He already hates me!" I laughed and concluded the "tone" of his trip would definitely change if he opted for the bushwhack. We parted company and I gingerly worked my around the eastern end of the pool. 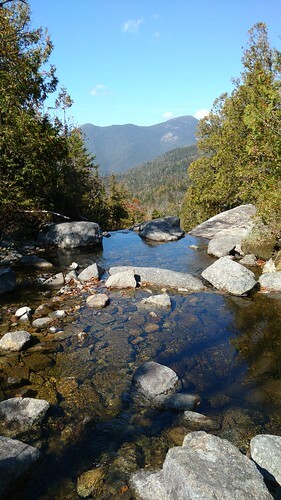 I was now back at the head of Uphill Brook Falls and stopped to replenish my water supply. My hydration bladder sprung a leak several hikes ago so now I use Gatorade and SmartWater bottles. Interestingly, I seem to drink more water this way because it's so easy to chug. 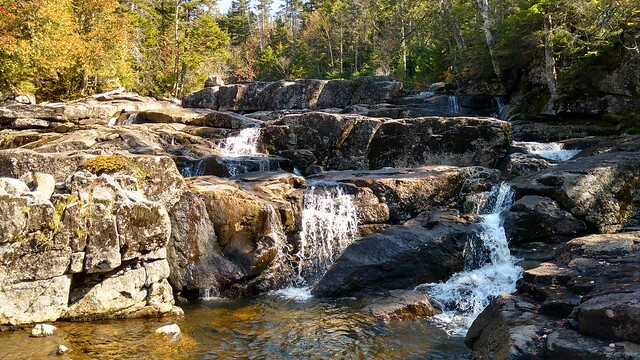 Much like Indian Falls, Uphill Brook Falls is a lovely place to admire the view while patiently waiting for the water filter to do its job. Iconic "Colden, Lake and Mountain." Except for the increasing complaints from my knee, the descent back to Lake Colden was uneventful. I inspected the designated campsites east of the dam and, again, found no changes. I said hello to a hiker drying his footwear on the dam and paused for a photo of the iconic "Colden, Lake and Mountain". Up the ladder, over the PUDs and I was back at Herbert Brook Lean-to where I met two marvelous gentleman. I spent the next hour shooting the breeze with them. I learned some fascinating stuff from these two "old hands", who I'll call Jake and John. Jake started his 46r quest in 1979 (like me) and finished in 1984 (unlike me; 2010). He climbed Iroquois in 1979, couldn't find the canister, and was just starting to descend when another group informed him the canister was inside the cairn. He returned to sign the logbook and record the names of the three previous hikers. When I was there in September 1979, I knew nothing about a canister in a cairn but Grace Hudowalski never challenged me when I reported I had climbed it (without supporting evidence). Either the canister was truly gone by September or Grace accepted the fact not everyone would guess the canister's location inside the cairn. Jake also confirmed that martens will open pack zippers to filch the contents. It has happened to others and the first culprit that comes to mind is a human because the zippers are left open. Jake said, in one instance, they had located the marten's den in a pile of brush and found eyeglasses and all manner of things one would normally keep inside a pack pocket. Jake and John had a bear canister but Jake insisted he never lost food the "old way". I asked if he meant hanging it in a tree and he responded "No, I hung it in the lean-to." He insisted that it always worked and the worst that would happen is the bear would pass directly in front of the lean-to, pause to sniff the air, and move along. I smiled and thought that would be a tall order for most people. Jake finished on Allen in 1984 by bushwacking from the Elk Lake-Marcy Trail. As one would expect, it was a tough slog and his group of three made it to the summit but ran out of daylight. Flashlights today are a far cry from the heavy, bulky, short-lived beasts of yore. His was the only flashlight that didn't run out so they walked single file, linked by arm on shoulder, through the thickest parts of the woods. He recounted a close call with a female moose and it was both funny and harrowing at the same time. If I was backpacking and had no other commitments, I would have stayed the night and listened to more of their stories. However, I had to exit so I thanked them for their company and we said our goodbyes. Within a few yards I met three Quebecers who had just descended from Marshall. I spoke with one all the way to the Flowed Lands register where I forged ahead. I watched my morning's hike unspool in reverse, except it felt longer. A strange slippery sensation in the sole of my right foot suggested I had developed a blister under the ball of my foot. That would be a first. I wondered if my aching knee had caused a change in my gait. If it was a blister, the damage was done and so I didn't stop to inspect it. The late afternoon sun was low in the sky and shone directly into my eyes,*occasionally blinding me to the trail's dips and curves. *Along the way I discovered a blue "Arctic Cool" scarf, either damp with water or someone's sweat, and hung it outside my pack. Just over eleven hours after setting out, I was back at Upper Works trail-register putting a checkmark next to my entry. I was fortunate to locate the owner of the scarf who was just minutes from leaving. He was the same fellow who had been airing out his footwear at Colden Dam. I sauntered over to my car and, over the next fifteen minutes, performed my usual ritual of sponge bath, clean clothes, and tidying. Fortunately, my feet were simply deeply wrinkled but not blistered. The Quebecers arrived just as I was pulling out of the lot and with a final wave I left Cliff, Redfield, and all the interesting people I had met. Next milestone on this long journey is round ten. Muted fall colors in the late afternoon sun. Very well written report & beautiful photos, Taras! Thank you both. I haven't taken the time to share some of my recent hikes so I spent a little extra time with this one. That first round was interesting. Between 1979 and 1983 I hiked 34 peaks. Then I lost interest. I only hiked two more 46er peaks over the next 25 years or so. In 2010 I realize I wasn't getting any younger and decided to finish them ... and did. 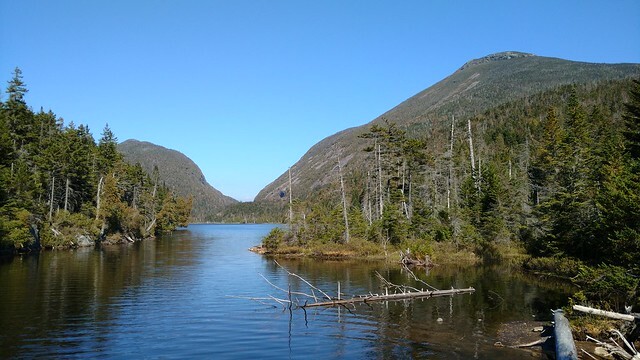 Then the hiking bug returned and I just kept going, another round, then a winter round, another winter round but in one winter, the four-season version of the ADK Grid, and now the 12-month full-meal deal. 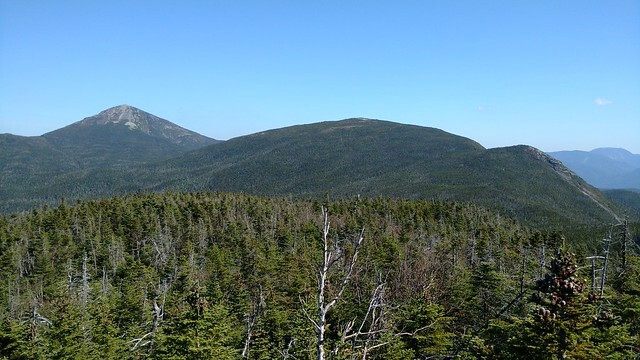 In between all that I also hiked the NE115 and also have my eye on completing the ADK Hundred Highest. Trailboss: You should submit that report and photos to PEEKS. Those photos are particularly awesome man. I enjoyed reading that! Nice work on finishing your 9th round, being close to your 10th, and on your quest for the Grid. How is it that you started the first round in 1979, but didn't become a 46r until 31 years later, but then have done 8 rounds in the past 7 years??!! Did you get lost for 30 years trying to find an open Stewarts, or do a long stint as a Navy SEAL or something??!! Looks like you answered this around the same time as I was writing and posting. Life took over. Graduated; first job; first serious relationship; home ownership, etc. Then you wake up 3 decades later and realize the clock never stopped ticking ... and it's now past noon. Time to finish a few things before the clock runs out.